After nearly two years of work, programming and testing we have completed sine modulation programming for our controller. The result is a smoother, quieter motor response. The AC drive eliminates the high frequency harmonics of a DC drive resulting in a motor that is much quieter than anything we’ve done before. Also, we can now program the same motor, which previously topped out at 1000 watts, and boost it up to 1300 watts. All systems now being sold have this type of motor programming! Sine modulation turns a DC motor into an AC motor. 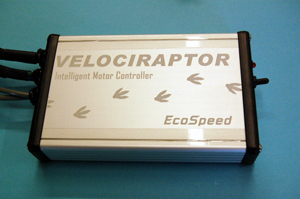 To pull off this hat trick, our new Velociraptor controller software synthesizes 3 phase AC current from the DC supplied by the battery. We program it to keep the AC waveform frequency in sync with the rotating motor allowing full performance at any speed, unlike common fixed frequency AC motors. Just give us a call at 503-233-1580 and we will try and work with you… did you buy the bike from us or from a private party?